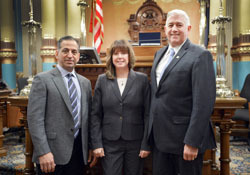 LANSING, Mich. — State Sen. Ken Horn, R-Frankenmuth, welcomed Shaheen Development President and CEO Dr. Sam Shaheen and Saginaw Future President JoAnn Crary to the Michigan Capitol before Gov. Rick Snyder’s 2017 State of the State address. Shaheen and Crary, both from Saginaw, were Horn’s guests for the annual address Tuesday evening. Shaheen and Crary have been heavily involved with Horn through the legislative process of getting developers the necessary tools to revitalize crumbling Brownfield properties. The two noted that Senate Bills 1061-1065 of 2016 had the potential to greatly benefit the Saginaw area, and that they look forward to Horn reintroducing the bills during the new session.